This post is coauthored by Austin Frakt and Aaron Carroll. We have already written many posts about Singapore’s health system (there’s a a tag for that), which is built around medical savings accounts (it’s Medisave program), though encompasses so much more. Unsurprisingly, we’re far from the first to comment on the system. But, contrary to what some have suggested, we’re not just interested in scoring political points. We want to know what data and evidence have to say about Singapore. This post summarizes a few points from some of the relevant literature from peer-reviewed journals. 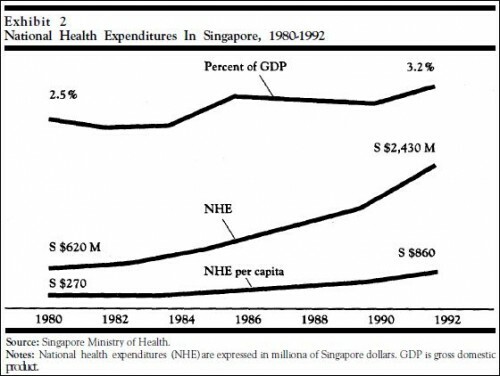 In spite of the high average rate of growth in GDP of 10 percent, Singapore’s health expenditures grew faster, rising from 2.5 percent to 3.2 percent of GDP between 1980 and 1993. In other words, health care spending increased after the introduction of increased cost-sharing, which is not what most proponents of such changes would expect. These points are repeated in Michael Barr’s “critical inquiry” into Singapore’s medical savings account, published in the Journal of Health Politics, Policy and Law (JHPPL) in 2001. But this was not a randomized controlled trial, and causality is, of course, not proven. In an accompanying commentary, Mark Pauly responded with two valid points, among others. First, it’s been well established that the more something costs an individual, the less of it they buy. It’s even been established for health care. Cost sharing definitely matters. Second, casual, pre-post examination of time series is uninformative about the effects of an intervention. How would Singapore’s health spending have changed in the absence of the Medisave intervention? We don’t know. Market forces alone will not suffice to hold down medical costs to the minimum. The health care system is an example of market failure. The government has to intervene directly to structure and regulate the health system. We cannot avoid rationing medical care, implicitly or explicitly. Funding for health care will always be finite. There will always be competing demands for resources, whether the resources come from the State or the individual citizens. Using the latest in medical technology is expensive. Trade-offs among different areas of medical treatments, equipment, training and research are unavoidable. Financing mechanisms alone do not define a health care system. Singapore has a clearly delineated policy that works in its setting. The state actively participates in every aspect of the delivery system, from physician supply to price setting and the establishment of service criteria. This willingness to intervene aggressively in the market (at levels probably unacceptable to most Americans) may be as important as the individual savings mechanism to its success. In a JHPPL commentary that accompanied Barr’s paper, Hsiao described other means of cost control. Again, however, point granted to Pauly that some restrictions imposed by Singapore’s government are not altogether different from those imposed by commercial plans in the U.S., for better or worse. We take this to mean that there really aren’t all that many ways to control costs in all areas. Ultimately, you have to say “no” in some fashion. The broader lesson from Singapore is that health care reform continues to swing back and forth between a belief in market forces and the use of government regulation. In reality, health policy is replete with examples of market failures and government failures as policy makers experiment with different instruments. The variety of health care systems developed around the world indicates that the choice is neither pure markets nor government control but the balance to be struck between the two. And to return to our starting point, where the balance is struck will be shaped by social values and the political choices that follow from them. There’s one more challenge in assessing Singapore’s health system, raised by Barr. The government is highly secretive about the detailed operation of its system and has not made either the data source or method of its calculations available to anyone outside those in the Civil Service and the government who need to know—not to the public; not to academic researchers. This probably explains why, though there is a literature on the Singapore health system, it’s a modestly sized one. It should also cause anyone serious to hesitate before advocating that Singapore’s system, and its results, can be generalized without some concerns. By the way, JHPPL also published a letter to the editor by Meng-Kin Lim (we gather this is his homepage) and responses from Michael Barr and William Hsiao. Finally, here’s a paper that compares Shanghai’s experience with medical savings accounts to Singapore’s. The bottom line is that Singapore isn’t simply “cost-sharing”, “free market”, “competition”, and a “lack of government involvement”. If you endorse Singapore’s health care system, you’re buying into many things, and some truths, that libertarians and conservatives claim to dislike. We acknowledge that more cost sharing can reduce spending. But if that’s the only thing you endorse, then you’re not talking about Singapore. Singapore has experienced such phenomenal economic growth that any measure of health care expenses is likely to be misleading. If the GDP grows by over 35% in one year (as it did in 2010-11), and health care expenses as a percentage of GDP decline by 10%, what does that indicate? 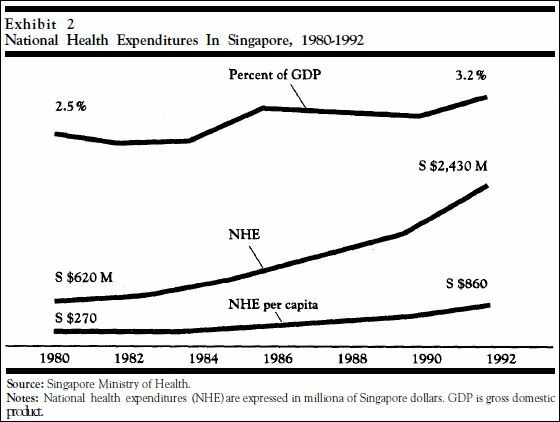 I wouldn’t take to much from the fact that health spending as a share of GDP rose after Singapore introduced their MediSave system. Health care is a luxury good (for you non-economists, please don’t freak out over that term, it just means as income rises people tend to buy more of it). I agree we shouldnt rely too much on any one number. Still, Singapore introduced MSAs believing that they would help control costs, which they already saw as a problem. It doesnt look as thought they were able to control costs by themselves. Singapore continued to have growth, but when they added direct govt intervention to the mix, they controlled costs. Maybe you need the mix of MSAs plus govt. controls, or maybe govt. controls alone would be sufficient. I dont think you can tell from the Singapore experience. Watching how Singapore has raised the shackles of folks interested or involved in policy the last few weeks has me scratching my head. Not so much because we cant learn a great deal, we can, but if we were to pick apart a system and ask, “by deconstructing the facts, what can we take away and apply in the US,” I would not think a platform emanating from a culture totally removed from ours, and with a govt sometimes resembling a benevolent police state, we would have the ideal correlate for lessons. At least with the Swiss, we have a kinship (played out a bit in debate, granted). The same goes for the Germans and the Dutch (read Stephen Ambrose’s great books on liberating those countries)–waiting for those dissections too. Not quite applicable on our shores, with our fondness for apple pie, hot dogs, and baseball.